This is not a lease, but more simply, a license. It does not create a legal interest in land. 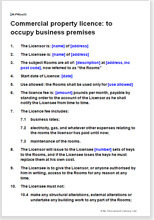 This agreement creates a licence to occupy commercial premises, not a lease. The difference is important because a lease creates an interest in land and gives the tenant additional rights - particularly with respect to stay in the property when the lease term expires. This property licence includes minimal and usual provisions in simple format, specifically to avoid it being interpreted as a lease. This document has been carefully drawn so as to avoid being interpreted as a lease under Property Law Act 2007. If you need a lease rather than a licence to occupy, we have a large collection of business lease agreement templates for all types of property. The document is not suitable for residential property. For that, see our documents within the category Lodger agreements and licences, or our standard lodger agreement.